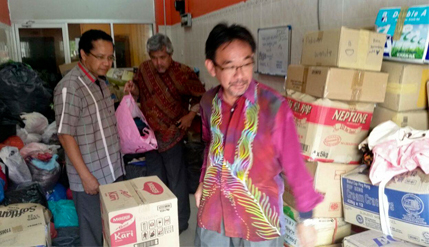 BANGI, 23 December 2014 – The National University of Malaysia (UKM) should make Community Service programmes as a core subject in the curricula of all its faculties to bridge the gap with local communities. Deputy Vice-Chancellor (Industry and Community Partnerships) Prof Dr Imran Ho Abdullah said the community service activities should be taken more seriously and not merely as projects run by volunteers. Prof Imran, who took part in an education conference of global universities, the Talloires Network’s Leaders Conference (TNLC 2014) in Cape Town, South Africa recently, said UKM should maintain its community projects and assess whether it intends to make it as a module in the syllabus of all its faculties. Speaking to the Corporate Communications Centre after returning from the conference, he said stepping up efforts for community service was in line with UKM’s 3rd Key Result Areas (KRA), namely ‘Smart Partnerships and Strategic Engagement’. “All our students from various fields of studies are familiar with the implementation of the community service programmes or OPKIM”, he explained. UKM has in fact been in the forefront in efforts to bring research to society as well as programmes with community involvement considering that society is a living laboratory to the university. “We can learn from universities in Latin America which require creditworthy community service programmes in all their syllabus,” he added. Their involvement in community service is measured by the number of projects and sponsors. Projects of a larger scale will have a sponsor and be able to achieve more participation by non-governmental organisations (NGOs). Community services involvement became the main agenda among eminent universities worldwide during the Talloires Network’s Leaders Conference (TNLC 2014) earlier this month. The TNLC 2014 brought together 350 representatives from member institutions of the Talloires Network – 322 universities from 72 countries including UKM. The conference also saw UKM as among the higher education institutions from Asia receiving grants from the Youth Economic Participation Initiative (YEPI). Eight universities – including the Universidad Austral Chile, Universidad Veracruzana Mexico and UKM – were awarded grants of between US$350,000 (RM 1.23 million) and US$465,000 (RM1.63 million) for three years beginning 2013 to improve their programmes to prepare graduates for the employment market. YEPI is a joint initiative between the Talloires Network and the MasterCard Foundation aimed at assisting universities in developing countries to accelerate the process of youth preparation for real-life careers, as employees or through entrepreneurship.